7 nights B&B in a variety of small quality guest houses with ensuite accommodation. Mixture of inns or pubs, bed & breakfasts and small hotels. They are located in delightful historic properties. Lunches are picnic meals, often provided by your guest house. Evening meals are taken in your guest house or in local pubs and restaurants where you'll have a choice of local cuisine. This self guided walking holiday in southern England explores the beautiful countryside of the Wiltshire / Dorset border including the Cranborne Chase, a former medieval, royal hunting estate. Your walk starts in the historic city of Salisbury with its cathedral, a masterpiece of early English architecture, boasting the highest spire in the UK; and finishes at Shaftesbury, a Saxon hill top town with stunning views, lovely historic cottages and of course, the stunningly beautiful Gold Hill. In between, your walking trail follows secluded valley meadows with babbling streams and idyllic villages, as well as following ancient Wessex routes on rolling chalk downland offering marvellous far reaching views. Each day you'll have a variety of interesting sites and experiences, as your walking trail meanders through some of the finest landscapes in southern England in the Wiltshire and Dorset hills. The most famous site is without doubt, the prehistoric stones at Stonehenge, which is at the centre of the most dense complex of Neolithic and Bronze age monuments in England, including several hundred burial mounds. 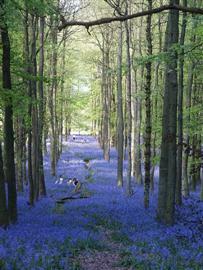 Your walking holiday also passes through rich wildlife areas such as ancient forests, which in Spring are carpeted in bluebells and protected chalk downs with orchids. 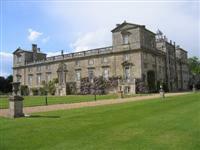 You'll also have the chance to visit the lovely house and grounds of Wilton House, the historic sites of Old Sarum and Wardour Castle, as well as a number of charming villages such as Ashmore and Tollard Royal. A moderate walking holiday with each day's walk averaging 17km or 10 miles with moderate ascents of about 120m at a time, with maximum daily ascent being 400m. The walk follows many different types of paths, tracks and small country lanes. Occasionaly the walking trail is steep when ascending or descending the chalk escarpments, but in general the walking is gentle in nature. Welcome in guest house in cathedral city of Salisbury in Wiltshire. You may wish to arrive early in order to have more time explore this lovely city and visit the cathedral with the tallest spire in the UK. 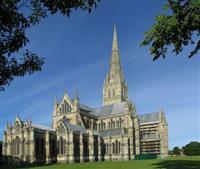 Extra nights at Salisbury are possible at the start of your independent walking holiday. For useful advice about independent walking and preparing for your self guided holiday please take a look at the articles in our top-tips section. Once you have booked on this independent walking holiday in southern England, further information about the walking, the region and what to bring, will be sent to you. We do have a web page dedicated to what clothes and equipment you should bring. In addition, our travel shop has direct access to all the top walking and travel retailers. Please contact us if you need any further information. 7 nights B&B in a variety of small quality guest houses with ensuite accommodation. Mixture of inns or pubs, bed & breakfasts and small hotels. They are located in delightful historic properties, mainly in villages, but some in beautiful locations in the countryside. The B&B's are generally 4 star AA rated. Lunches are picnic meals, often provided by your guest house. Evening meals are taken in your guest house or in local pubs and restaurants. There will be plenty of local specialities to try and of course the local real ales. A couple examples of the types of guest house we use are shown below. Salisbury is served by a main line train station. Routes from London are via Waterloo station and take about 1hr 30min. There are 3 local airports with international flights: Bournemouth and Southampton are about 30 minutes drive away, whilst Bristol is about an hour away. 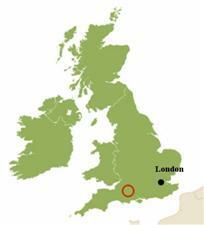 The 3 London airports are between 1hr 30 and 2 hrs drive away. National Express operate services to Salisbury from cities throughout the UK including London. Advance ticketing is required. Note: Please check concerning the availability of a holiday before booking any flights or trains. If you need further information or would like to discuss any aspect of your travel arrangements, please contact us, we’re here to help you.